Managing files is a constant task for users who want to maintain order and consistency. Locating, deleting, and moving files, or opening them in an application program is greatly simplified through the use of a file manager. This installment of my series on open source file managers covers Krusader. Krusader is an exceptional graphical file manager that is modeled after the text mode Midnight Commander (mc) file manager. Krusader provides many features that enhance the functionality of Midnight Commander, such as tabs along the bottom of the directory panes, which allow the user to have multiple directories open in each pane and switch between them by clicking on a tab. Krusader not only allows you to use the same keyboard navigation and command structure as Midnight Commander, but it also allows you to use the mouse or trackball to navigate and perform all of the standard drag and drop operations you would expect on files. You can launch Krusader from the Applications | Utilities page of the Application Launcher. Click on the File Manager / Krusader icon to launch the Krusader file manager. Note that your desktop probably will look different from the ones in these examples. The first time Krusader is launched, you will be taken through a series of configuration steps. Making any changes here is not necessary, especially if you have not previously used Krusader and have little idea what options mean. You can make desired changes later. The Krusader interface looks similar to the figure below. I have extensively customized mine, so your initial look at Krusader on your own Linux computer will not look like this. However, this illustration show the elements that give it its power and flexibility. 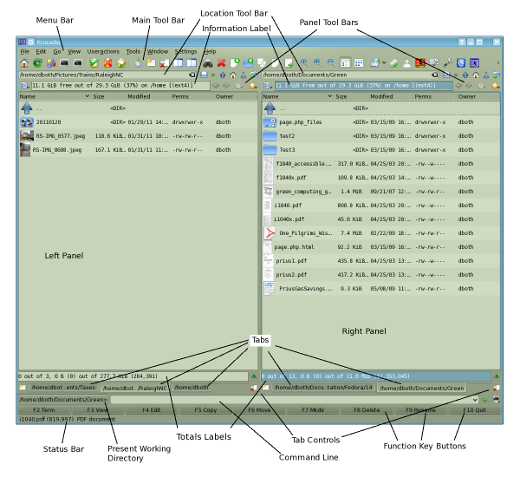 The Krusader interface has two panels in which files and folders are displayed. This makes drag and drop moves, and copies from one panel to the other easy. Additionally, each panel can have multiple tabs, so that more than one location can be displayed in each panel. Menu bar: Provides access to all Krusader menu items. Main tool bar: Provides quick access to the most frequently used functions. Location tool bar: Shows the current location, or Present Working Directory (PWD) for each directory panel. The Location Tool Bar also allows the user to type in a new path or edit the existing one in order to navigate to other locations. Information label: Displays information about the filesystem (on which, the directory displayed in each panel is located). Left/right panels: Each panel provides a viewing space for the contents of a directory (i.e., a folder). The icons representing files and folders can show a generic icon or a preview of the contents of the file or directory. The number of panels cannot be changed, and there can only be two panels—no more and no less. Panel tool bar: Provides navigation buttons for each panel, such as home, Root, Up one level, etc. Tabs: Each panel can have multiple tabs, which enables quick switches between currently opened directories. The tabs can also be displayed at the top of the panels. Totals labels: Display the total number and size of selected files or directories. Tab controls: Provide buttons that allow adding new tabs or deleting existing ones. Present Working Directory: Shows the present working directory (PWD) (i.e., the working directory of the active panel). Command line: Provides a space to enter commands directly as you would on a terminal command line. Function key buttons: Press these GUI buttons with the mouse pointer or use the function keys on your physical keyboard to access the labeled function, such as copy, move, and delete. These function keys duplicate the functions of the text-mode Midnight Commander. Status bar: Displays information about the selected file in the active panel. The menu bar contains the drop-down menus that allow access to all of the features and functions of the Krusader file manager. This includes things such as the ability to choose which panels are displayed, configuring the toolbars to show additional icons, and configuring the overall functions of Krusader. The tool bars are the rows of icons just under the menu bar. They provide ready access to many functions of Krusader. You can configure the tool bars to contain the icons for the functions you use most. Konqueror has three separate tool bars, each of which contains closely related functions and that can be configured separately from the other tool bars. Unlike Konqueror and Dolphin, Krusader does not have a sidebar that allows rapid navigation, but it does have a good alternative. To the left of the location bar in each panel is a folder icon that opens a file dialogue window, which provides easy navigation around the directory tree. Click on the icon to open a window that looks and works like a navigation sidebar. Krusader’s tabs allow you to switch between different directories in one panel, while not changing the directory displayed in the other panel. This makes it easy to navigate to multiple places in your filesystem and have multiple directories open simultaneously. Directory contents can be displayed in the panels in one of two views. The Brief view simply displays the directory contents as columns of icons with only the directory or file name beside them. The Details view shows additional data about each object, including its size, last modification date, permissions, and ownership. Each directory panel has its own toolbar that allows easy access to navigation functions, such as home, up one directory, and up to the top-level directory. Not all functions are displayed by default, so you will have to configure the directory panel toolbars to show any additional buttons you might need. Like the other file managers I have covered in this series, Krusader is highly configurable. 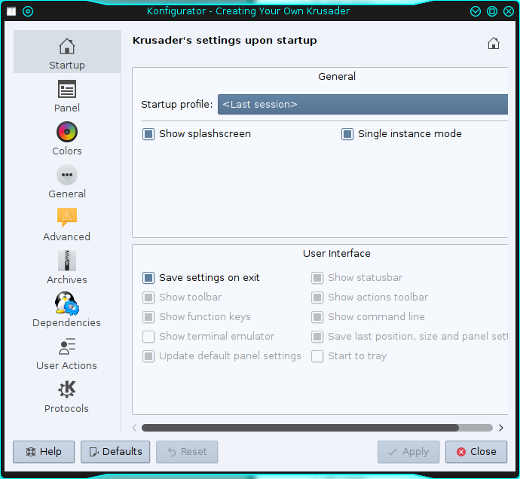 Use the Menu bar and choose Settings | Configure Krusader… to open a panel that provides many options for configuring how Krusader looks and works. I particularly like the option to specify a startup profile. Creating profiles that open tabs in specified directories when Krusader is launched (so that it will always start exactly the same way) is easy. The Last session option is to start in the locations that were open when Krusader was last closed down; this makes it easy to start up where you left off. The Panel configuration page contains many options and tabls that allow you to configure how the panels look and work. I particularly like to place the tabs at the top of the panels rather than the bottoms. There are also options for defining the font face and size, sorting methods, and the default view mode—detailed or brief, whether to show hidden files, which buttons and toolbars to show, a choice of layouts, and much more. The color page lets you choose the colors for various components of the Krusader windows, but I prefer to use the default KDE colors. 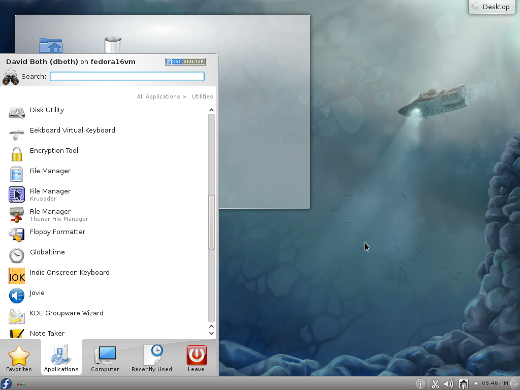 The standard KDE selection actions work in Krusader. You can select one file with the mouse or space bar, and files using the Ctrl or Shift keys. You can also configure whether to use single- or double-click to initiate actions, such as launching programs, so be certain you know whether you can use a single click to make the initial file selection or whether the single click will open that file in an application program. All good file managers must be able to move and copy files. As you might expect, files can be moved or copied simply by using drag and drop—simply select the file or files and drag them from one panel to the desired new location in the other panel. You can drop them on the open panel or on a tab for a panel that might be hidden below an open tab. Deleting files is easy: Select the files to be deleted, right click, and choose Delete. The default action for Krusader is to move the “deleted" files to the trash bin, but it can be configured to delete them immediately. Krusader can launch a program by clicking on a data file. For example, clicking on a Word or LibreOffice document file opens that document in LibreOffice Writer. In KDE, data files can be associated with specific applications using System Settings | File Associations. Krusader honors these file associations when launching programs. If you want to open a file using a different program, you can right click on the file you want to open and choose Open with… from the context menu and choose a different program. For example, you might want to open a document file using Calligra rather than LibreOffice. There is a command line at the bottom of the Krusader window, just above the function buttons. The command line allows you enter CLI commands for the active panel and tab. I find this command line to be marginally useful for the things I do, so I usually configure Krusader so that this command line is not displayed. I prefer to use the full terminal emulator window, which can be displayed as an integrated part of the Krusader window. In the Settings menu, choose Show terminal emulator. This will connect with the remote host as the user “user". You can use any valid user with a login account on the remote host. A dialog will pop up to ask for the root password. Once authentication has completed, the active panel will display the contents of the /etc directory. Of course, you can specify any directory to which the authenticated user has access. But that is not the best part. Using GUI applications like LibreOffice to edit compatible files on the remote host is easy; click on the remote file the same as you would if the file were local, and LibreOffice opens on your local host with the selected file. This is possible even if the remote host does not have LibreOffice or a GUI desktop of any kind installed, because the file data is transferred to the memory of your local host and LibreOffice is loaded from your local host. You can edit the remote file as if it were located on your local host. The best file managers handle archives as if they were simply directories full of files, and Krusader is no exception. Whether the file is a ZIP, tarball, RPM, CPIO, or other archive format, simply clicking on an archive file opens it and displays its contents in the directory panel. You can view files or even copy them out of the archive to a regular directory. This is an easy way to retrieve files from an archive to replace damaged ones. As I mentioned at the beginning, Krusader is my favorite file manager— it is powerful and flexible and meets my needs in a graphical file manager almost all the time. I am most comfortable with Krusader because of its resemblance to Midnight Commander—the text mode file manager—in so many ways. By remaining true to the text mode operation of Midnight Commander, while offering additional capabilities that are most effectively integrated into a GUI environment, Krusader enhances the functions of a file manager with the best of both worlds. There are a lot of Krusader features that I have not covered in this article. Many more of Krusader's features allow it to be incredibly flexible in how you work with it. I hope you will use this article as a starting place for your own explorations of Krusader. I certainly learned a lot more about Krusader while researching this article. It's nice to see a great write-up about Krusader file manager. I've been using it for at _least_ 7 years. It does so much more than browser-like file managers and, for me with my carpal tunnel making it so I can't touch-type, still has the power and more of a CLI like Midnight Commander. I think it's a shame it's less known than it is and that more dev's haven't jumped in to help the regular one (two?) devs who maintain and work on it. As far as I'm concerned, this should be the default file manager for KDE over that abortion called Dolphin. David, very good articles on file managers. My question is not specific to krusader, but for some reason I cannot comment on your more general article “8 file managers”. Do you know a file manager that supports treeinfo files? A concept first already found with the mother of all file managers, the god ole Norton Commander, carried on with clones like the Total Commander (imho the best for “the other OS”). The treeinfo file is simply a list of directory paths of a volume (basically a "find . -type d"), usually residing in the root of this volume (or a configurable location). The FM takes this as a DB to allow a quick jump deep into the directory tree by typing very few relevant letters of its name. (Type “bea” and it already suggests “/Music/oldstuff/70tth/beatles”) I use this feature a lot where it is given, but I dearly miss it with linux file managers. I am not aware of any Linux file managers that support treeinfo files. But that does not mean there are not any. Perhaps someone else reading these comments might know of one. However on the menu bar of Krusader, you could use Go==>Popular URL's or just do Ctrl-Z, either of which opens a popup with the most popular directory URLs listed. You can search with by typing in the Search field, or scroll through the entries. A bit more clicking but it may be an alternative for you. Please let us all know how that works out for you. Thanks! Thanks for your quick response! Yes, schemes like favourites, recent, bookmarks, are all features in good file managers, and they work perfectly as expected. But this idea is different. In the example above I have not been to Beatles (with a FM) for ages, and the next time it will be "Roll"ing Stones. I know this is a very distinct feature, and most people are not even aware of it where it is implemented (though the Total Commander brought this to perfection), but I am so used to it!! Might be worth a hint to developers, because IT IS NICE, I use it since DOS times! Wine.... not as good as native linux, but perhaps one could give it a try. If you care enough to have the updatedb properly configured, shift-ctrl-L is ALMOST as good (still lacks speed and type-on-until-satisfied) and I will give it a practical try. When I wanted to suggest this to the wanted-feature list in the developer's forum, I found I was not the first, but it had not many "second this".